By Sebastien Malo. December 16, 2015. Thomson Reuters Foundation. A United Nations team of war crimes investigators will not probe air strikes by foreign countries in Syria, its chairman said on Wednesday, despite concerns that some attacks by foreign militaries could have violated the laws of war. The U.N. Commission of Inquiry on Syria is not intended to investigate air strikes in Syria by foreign nations, Chairman Paulo Pinheiro said. “It is not our mandate to investigate the behavior of powers involved in the crisis of Syria,” Pinheiro told the Thomson Reuters Foundation in a telephone interview. It would not probe potential cases of violations of international human rights law involving nations conducting military strikes in Syria, he said. “There is no possibility that we will investigate the American air strikes or French or British or Russian,” he said. The decision reflected a desire not to meddle into the affairs of powers outside Syria as well as limited means at the group’s disposal, Pinheiro added. 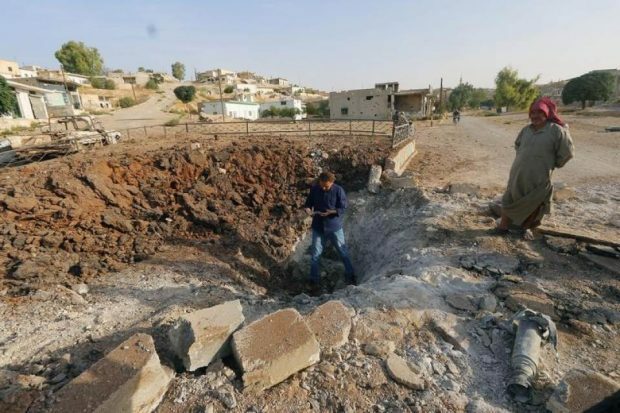 With the rapid expansion of territory controlled by the militant group Islamic State, nations including the United States, France, Britain and Russia have carried out air strikes on targets in Syria. Some observers have cited instances that disproportionately hit civilians and civil infrastructure, and Pinheiro and his three co-commissioners have repeatedly cautioned powers to follow the laws of war. Embodied in the Geneva Conventions, the rules require warring parties to distinguish between military and civilian targets, such as schools and hospitals, and carry out operations in a way that is proportional to the perceived threat. U.S. officials said in November they did not dispute human rights activists’ allegations that Russian bombs and missiles have hit Syrian mosques, hospitals and other civilian infrastructure, killing hundreds of people. Among these allegations, the UK-based Syrian Observatory for Human Rights said in a Nov. 20 report that air strikes by Russia left 403 civilians dead, including more than 160 women and children. UNICEF condemned earlier this month air strikes that it said reportedly hit a water-treatment plant in the northern city of Aleppo. It was unclear whether the attack had been conducted by domestic or foreign forces. Watchdog Human Rights Watch said in an Oct. 25 report that at least two air strikes possibly carried out by Russia had killed 59 civilians in Homs. The group, citing the possible use of weapons with indiscriminate impact such as vacuum bombs in populated areas, said the strikes could have violated the laws of war. The U.N. commission was set up shortly after the start of the nearly five-year-old Syrian civil war, which has forced more than four million of refugees to flee the country and killed some 250,000 people. Its mission is “to investigate all alleged violations of international human rights law since March 2011 in the Syrian Arab Republic,” according to the website of the U.N. Office of the High Commissioner for Human Rights. Thomson Reuters Foundation: U.N. war crimes team will not investigate foreign air strikes in Syria.